During his trip Jan. 21 – 25, Faller visited Honduras, Guatemala and El Salvador. The trip was the admiral’s first to Central America since assuming command of SOUTHCOM Nov. 26. Faller’s contingent included SOUTHCOM’s Civilian Deputy to the Commander, Amb. Liliana Ayalde, and Command Senior Enlisted Leader, Marine Sgt. Maj. Bryan K. Zickefoose. Honduras was the first stop of Faller’s trip. 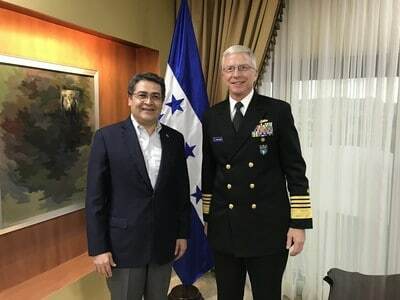 In Honduras Jan. 21 – 22, the admiral met with Honduran President Juan Orlando Hernandez, Minister of Defense Fredy Díaz, and Chief of the Honduran Armed Forces, Maj. Gen. René Orlando Ponce Fonseca to discuss the continuation of both nation’s security partnership. Honduras is a trusted partner in regional efforts to combat illicit traffickers. In a press briefing in Honduras Jan. 22, Faller highlighted the importance of partnerships to address threats and challenges in Central America. “We know partnerships work; and we know partnerships between friends who trust, respect and support each other work best. That is why I’m here, to continue our enduring promise, as both a partner and a friend — ready to continue our collaborative work in support of the peace, security and stability we all value,” said Faller. Faller and Zickefoose spent time at Joint Task Force-Bravo which is located at Soto Cano Air Base, Honduras. The task force supports training engagements, counterdrug missions and humanitarian and disaster relief efforts in Central America. Faller and Zickefoose toured the task force and took time to speak with assigned U.S. service members there. Also during the Honduras trip, Faller toured an elite Honduran Police unit that is combating illicit traffickers in the country and visited a USAID-supported outreach center that supports youth development in the country. In Guatemala Jan. 23 – 24, Faller met with the nation’s security leaders, including Guatemalan Minister of Defense Maj. Gen. Luis Miguel Ralda Moreno. Discussions focused on continued support for Guatemala’s counter trafficking efforts, human rights efforts and future U.S. military engagement activities. Faller also visited an elite Guatemalan police unit and an interagency task force – both focused on countering illicit traffickers in the nation. In El Salvador Jan. 24 – 25, Faller met with Defense Minister David Munguía Payés and reaffirmed the strong security partnership between both nations. El Salvador is an important partner that provides key support to regional counter illicit trafficking efforts. This trip was an opportunity to express continued enduring commitment to the region and also meet with key partners to understand their concerns regarding shared security challenges, Faller said. “A lot of attention has been given to the security challenges this region has faced over the last few years, and to the impact it has had on the lives of citizens in the region. At SOUTHCOM, we are confident we can advance towards countering those challenges as security partners,” said Faller.